Anatomy is a big part of medicine, fundamental in our understanding of how the body functions and crucial to allowing us to have an in-depth knowledge of why some conditions present in the ways that they do. As you get further into the degree, you’ll encounter some of the same terminology and anatomy over and over again, but for your first few years it can be a big mess of confusing words, arbitrary pointing at cadavers and the blank nodding of heads. I can assure you of one thing: Anatomy is not a complicated science. At its worst, it can feel like learning a new language, but once you get past that it boils down to association and description. If it looks like a duck and quacks like a duck, then 95% of the time it’s a duck… but sometimes it might be a goose. Anatomy likes to throw a few curve balls every now and then. However, you’ll never learn (or stay awake!) in your sessions by staying quiet and not trying. The goal of anatomy is to create a standardised way of describing and viewing the body, so that you can speak to any doctor or clinician and you will both understand the location on the body that you’re describing. This short series of blog posts is intended to introduce you to some of the very basics of anatomy that you’ll use all along your career- terms that you’ll be expected to be very familiar with using by the time you reach clinical years. To the best of my abilities (and limited IT skills) this blog should help to prepare you, and be a good reference for orientating yourself to the body. This first post will look at the different ways or ‘axes’ of viewing the body when we look at the innerworkings of it. You’ll see these views in the dissection room and in any imaging scan that you view. Before we dive into the technical terms, the most basic thing to know is that whenever the body is described by clinicians it is always referred to in the same way: The Anatomical Position. This is as if the person is stood up straight, with their palms turned facing forward. With a standard framework to look at, the intricacies can begin. Starting big and working smaller, whenever you view a body scan (A CT or MRI, for example) it will be presented in one of three ways, along a different body axis: Transerve, Saggital or Coronal. The body is a 3-D structure so these different views let us view the body in all dimensions. We will use loaves of bread as a visual example! This is our loaf, liberated in Fallowfield Sainsbury’s from the reduced bakery items. It represents a body in the anatomical position, and we will slice it in different ways to show the different body axes. Transverse – This is probably the easiest view to imagine and to become comfortable talking about. A transverse view is a view in the horizontal plane- essentially, imagine someone chopped in half at the waist and that’s what a transverse view is. Saggital – This is the view down the vertical plane of the body that divides the body into right and left halves. Picture a line of symmetry along your body, as you look at yourself in the mirror, and this is the saggital plane. Coronal – In contrast, the coronal view is probably the most difficult to visualise. The coronal view is another vertical view of the body, but instead of splitting the body into left and right, it splits it into front and back. It sits perpendicular to the saggital plane. If you look at a person side-on and imagine a line running down their body, this is a coronal view. 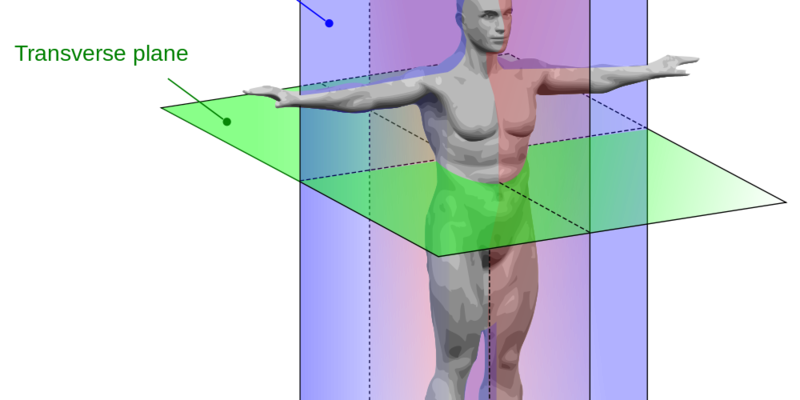 We can take many slices through these axes on a body scan to see the body the whole way through. MRI and CT scans take many images of the body as ‘slices’ in one axis and piece them together give us a full body image. Back to our bread analogy, this is the same as slicing bread- you can move along the whole loaf of bread by taking it apart slice by slice. When viewing body scans, the standard way to view them is looking from the bottom-up. So, if a patient were to be lying in a hospital bed, the view that you would see on their transverse section is as if you were stood at the foot of their bed looking up through them. Essentially, this means that- just like an X-ray- everything is flipped around. What appears on the left in the scan, is on the right hand side of the patient, and vice versa. You’ll first encounter body axes in the anatomy labs when looking at prosections, which will be prepared along one of the axes mentioned above. Don’t forget about the bread!